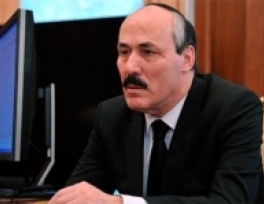 I have not fully realized how deep the crisis that covered different areas of Dagestani society was", - said the leader of Dagestan - Ramazan Abdulatipov in an interview to “Vzglyad” newspaper. He said that in order to fight effectively against terrorism, we should clear governmental bodies from those who support such people. Dubbed as the new rising star Anzhi Football Club since the beginning of the year did not win a single match in League of Europe, although at the end of last year was seen as one of the possible winners. Whether he is worried that Anzhi FC is fading away the President replied that he believes in Anzhi.“Anzhi reached semi-finals of Russian Football Cup. Recently we defeated FC Dinamo in quarterfinals. For us, football and Anzhi is more than sport. I am not a football fan, but seems gradually becoming. I strongly support our club. I had a meeting with Guus Hiddink and Roberto Carlos and presented them with awards. Anzhi players should live in Dagestan. We plan to build a big sport complex where they will be able to live, train and leave republic only for matches. The most striking victories of our team are still to come. I believe in their success,”he added.